Ok, here’s a photo of the real reason that we went to Lae (not the hamburgers we wrote about in our last post, though those were good too). Brian and I have been praying about buying a vehicle – a good, rugged four-wheel drive jungle machine. But cars are a lot more expensive here, so a new Landcruiser with a snorkel and winch (Brian’s dream car) was definitely out of the question. And as for used cars, they tend to be very, very used. Every time we saw a vehicle advertised that looked like a good prospect, it just didn’t work out. Either someone bought it before we could look at it, or, in one case, the owner (a Papua New Guinean) suddenly had a family emergency and had to quit his job, pack up the truck, and move back to the village! But then we heard about this truck, which was being sold by another mission. It looked like just what we wanted. I told Brian to call on it, just for fun, because I was sure that it was out of our price range. We were surprised to hear that not only was it reasonably priced, but that it was also still available. We arranged a quick trip to Lae, praying that if it was not the right one for us that the door would be closed. But everything went smoothly. The owners tried to show Brian the interior first, but he went straight for the hood, because that was what he cared about. After crawling around on the ground and peering at the car’s underbelly and insides, he liked what he saw, so we took it for a test drive. The next day, we were headed home with our new vehicle. Brian drove our new truck home, and I followed him in the rented van, which was nerve-wracking for me, because it was my first time driving on the highway in PNG, and I was in the car alone to boot. Brian is happy because when a mechanic is without a vehicle, all is not right with the world. Now he has a hobby – something he can spend his free time fixing and maintaining and lovingly washing on the weekends. And I’m happy because I can drive when it’s pouring rain, and it’s a reliable truck that can take us out to the village, saving hundreds of dollars that we would have spent on renting a vehicle. For those of you who care about such things, I’ll let Brian give you some technical details below. If that’s not your cup of tea, you can stop reading here. 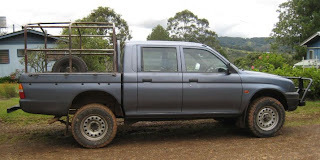 The truck is a Mitsubishi L200, but in some countries of the world it is also known as a Triton. What year is it? Well we are not exactly sure, it is either a 2000 or a 2001 (both the seat belts and engine say 2000, but the paper work says it was originally bought in 2001). In PNG the year of a vehicle is not that important, because they don’t change everything each year like they do back in America. The cars they sell here look exactly the same year after year, in fact they sell brand new 2009 Ford F250’s here that look an awful lot like a 2002 model and they come with inline six diesel engines and not Powerstoke V-8’s. Anyway back to our truck. It is right had drive (so in America it would make it easy to deliver the mail), has a 2.8L four cylinder diesel engine that is naturally aspirated (no turbo charger), five speed manual transmission, four-wheel drive, limited-slip differential, mud terrain tires, independent front suspension, AM/FM stereo, brush guard, already stained seats, rubber flooring, scratches in the paint and a canvas cover for the frame on the back so that our cargo stays dry as we are out and about PNG. What is doesn’t have is A/C, CD player, MP3 port, power anything (that’s just more stuff to break), and GPS. In PNG it is all about functionality and reliability over shiny wheels or loud speakers. There were a few little things that had to be taken care of once we arrived back into Ukarumpa (new front shocks, front sway bar bushings and an oil change), but nothing a seasoned mechanic in the backwoods of PNG couldn’t handle. All in all it should be a good truck and we are excited about the adventures that we will have in it, or at least driving to hamburger night at the Teen Center when it is raining. looks like a fine piece of machinery to me! Wonderful news. Congrats on the new member to the family (in case this starts a rumour -Im talking about the CAR! ).